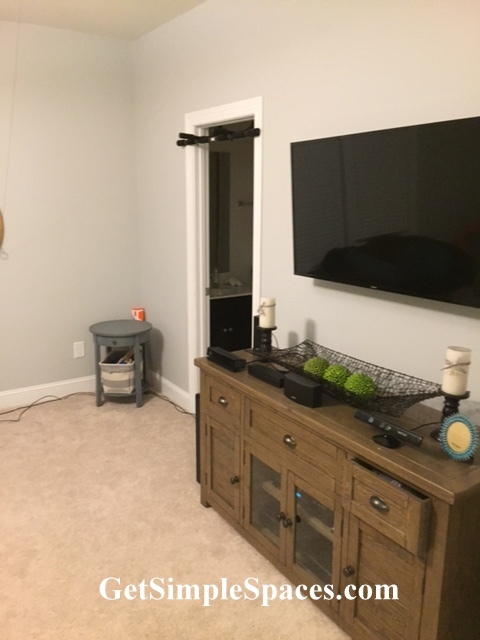 Bonus rooms are one of the most difficult rooms in a home to organize, and make “pretty.” I have a client who hired me a few years ago to organize her bonus room/home office. She has since sold her home and moved away. She contacted me at her new home, reaching out for help on her bonus room yet again. She had tried using the same furniture with similar setup, but every space really is different and requires a unique strategy (as well as new furniture sometimes). With this client living out of town, we did long distance consulting. She sent info and pictures via email, we talked and looked at the room on FaceTime, and we spent a lot of time texting back and forth with pictures of furniture & décor. Not being able to see things in person can be somewhat of a challenge, but I find that it can work really well. My client took pictures for me to share in this post, so I’m super excited to share the process and results with you! Below are some of the pictures of where we started. 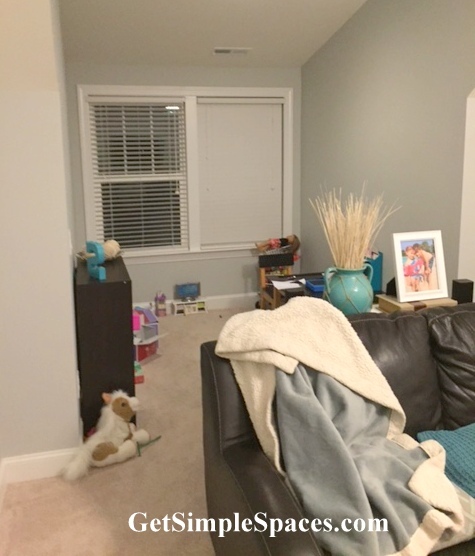 Behind the couch is a nook that needed a major facelift. The bonus room in the previous home had several different functions, and we made them all happen in style! 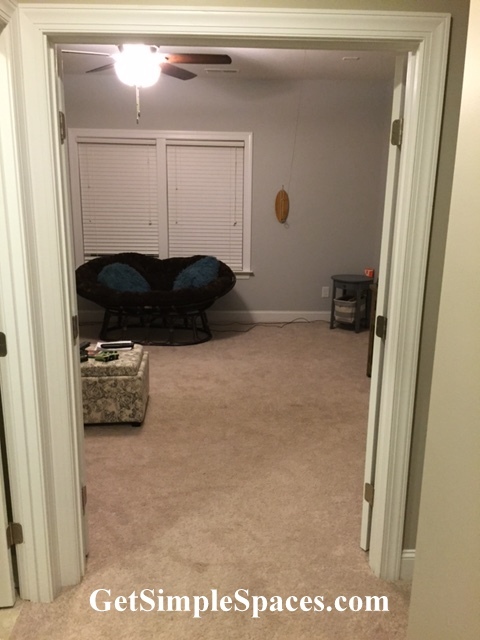 You can see the work we did here in Home Office Redesign. The space in my client’s new home had fewer purposes to serve. It is first a hub for family entertainment/media. Secondly, my client does her workouts in this space. And finally, she needed a place to store a few toys for her daughter who uses this space for play. May we not forget, my client wanted it to make her smile, feel at peace, and be a place where she wanted to hang out! It needed to look good. My client wanted more seating, enough for the entire family to be able to sit and watch movies. She also liked the look of a sectional. She wanted to use similar colors, but lighter. We decided to go with this, and I love it! I really like this “Family Rules” canvas that she chose for the wall. She wanted to make a statement that represented her family, in the space where they will spend the most time together. I think it was an excellent choice! Remember the nook that needed a facelift? Well, we explored built-ins. Shelving and a bench seat. The result is phenomenal! For the built-in shelves, I recommended a combo of cabinets below for storage for toys and other hidden items, and open shelves up top for display and more hidden storage via baskets. The built-in bench is so inviting! We spent quite a few back & forths to pick the perfect pillow ensemble. I enjoy “figuring out” my clients and their style and personal preferences. It’s always fun when everything “clicks” and I can help them put together exactly what they want! I am so thankful for the opportunity to work with this repeat client. I provided a framework for the space, guidance, help with decision making, and she took it all and ran! I think she did a fantastic job on making this space both a functional and refreshing place to be for her family. I would want to be in that room all the time! Thanks for reading! I love hearing your thoughts. Are you struggling to make your bonus room both functional and fashionable?